Though radon gas occurs naturally in the world, it poses risks when found in high concentrations. Unfortunately, radon gas can collect even at home. To combat this risk, many homeowners purchase radon detectors to detect the gas in homes and wells, thereby preventing any potential adverse effects. Radon is a colorless, odorless, radioactive gas that forms as other radioactive elements—such as uranium—decay in the soil. The gas can be released into the air from cracks under a building’s foundation or from bodies of underground and surface water. Local geology, which can vary even within a single neighborhood, determines whether or not radon exists in your area. It is typically present closer to ground level in areas like basements, crawlspaces, foundations, sump pumps, construction joints, rivers, and lakes. In confined areas and structures with less ventilation, the gas can more quickly reach much higher levels. The National Cancer Institute cites radon as a leading cause of lung cancer, second only to cigarette smoke, causing somewhere between 15,000 and 22,000 lung cancer deaths annually. Anyone who smokes and is also around higher radon levels is at an elevated risk of developing lung cancer. For something that’s completely invisible, silent, odorless, and tasteless, radon is surprisingly dangerous to your health. According the U.S. Environmental Protection Agency (EPA), lung cancer from radon exposure kills more people each year than carbon monoxide poisoning, drowning, and house fires. The risks are even higher if you smoke. Radioactive particles from radon gas can get into your lungs and release bursts of energy, damaging the lung tissue and leading to lung cancer. Keep in mind that not everyone who is exposed to high levels of radon will get lung cancer. According to the EPA, only about 4% of nonsmokers will get lung cancer from radon exposure, even from greatly elevated levels of the gas. When determining the six best radon detectors, we primarily considered accuracy and ease of use. Some radon detection kits underreport levels, so we sought ones that produce accurate readouts, and some radon detectors are difficult to install, so you end up paying for not only a radon test but also an installation service. 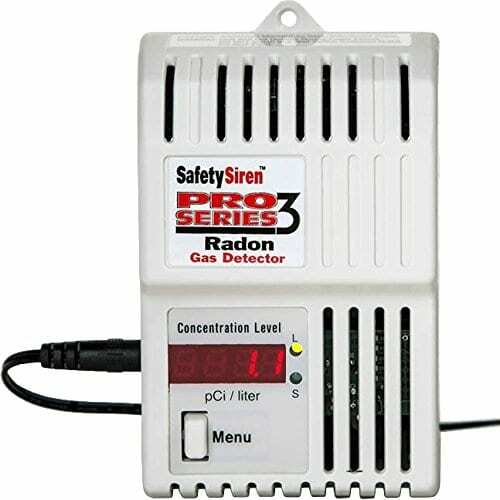 The six radon gas detectors below are the best, and the first two offer continuous monitoring. Be careful when making a purchase, as some sites allow you to buy used radon test kits—but this invalidates the test. Always buy a new radon detector. 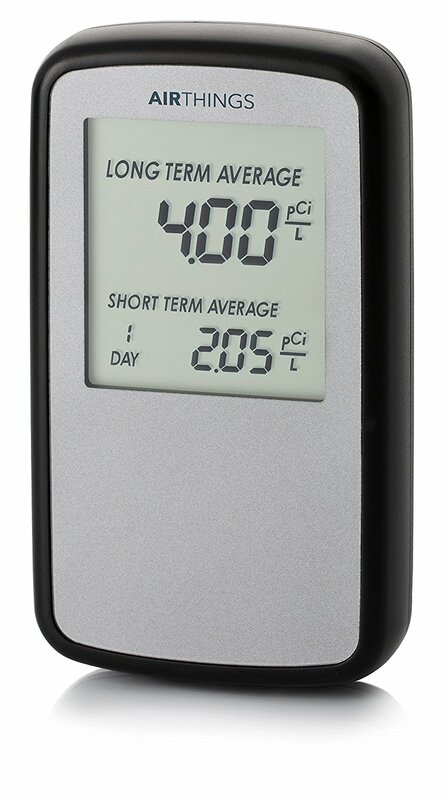 Also, if you live in an area prone to high radon levels, you may want to invest in a digital radon meter that can be used for short-term and long-term radon testing. The Safety Siren claims a high price tag of the others listed here, but the EPA-evaluated device lasts longer than any other radon detection kit out there. It is a digital monitor that displays the radon gas level—both short- and long-term averages—and will last up to five years. Pros: It offers short- and long-term readings and automated self-tests. Cons: The price tag could be a deterrent as most other DIY radon detection kits are fifteen to thirty dollars. Also, the Safety Siren isn’t for sale in Iowa due to the state’s public health rules. 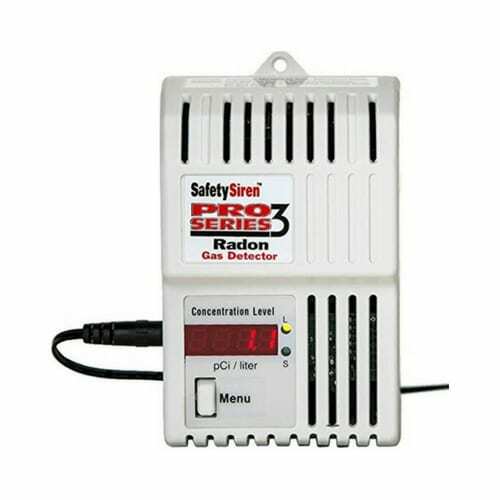 Pros: You can easily move the detector to conduct tests in different areas of your home—or even at your workplace. It boasts high accuracy, too, with a 5% variance. Cons: Corentium’s detector takes three AAA batteries, so you’ll have to remember to replace them every couple of years. Pros: The detection kit should give more accurate results since it samples your home’s air quality for an extended length of time. Cons: You need to pay forty dollars for a lab to analyze your test kit’s results. Also, this isn’t the best kit for quick results—the shortest measurement it can take is three months. First Alert offers an easy setup and fast analysis. The company delivers test results, along with a detailed action plan, within seventy-two hours of receiving your radon sample. This is a great kit for home buyers, as the kit only needs forty-eight hours to test radon levels. Pros: First Alert claim’s kit claims nearly 900 Amazon reviews, coming to rest at over four stars. It also claims a spot on the EPA Radon Gas Measurement Proficiency Program. Cons: You are responsible for return postage costs, and the price does not include the lab fee costs for New Jersey residents. 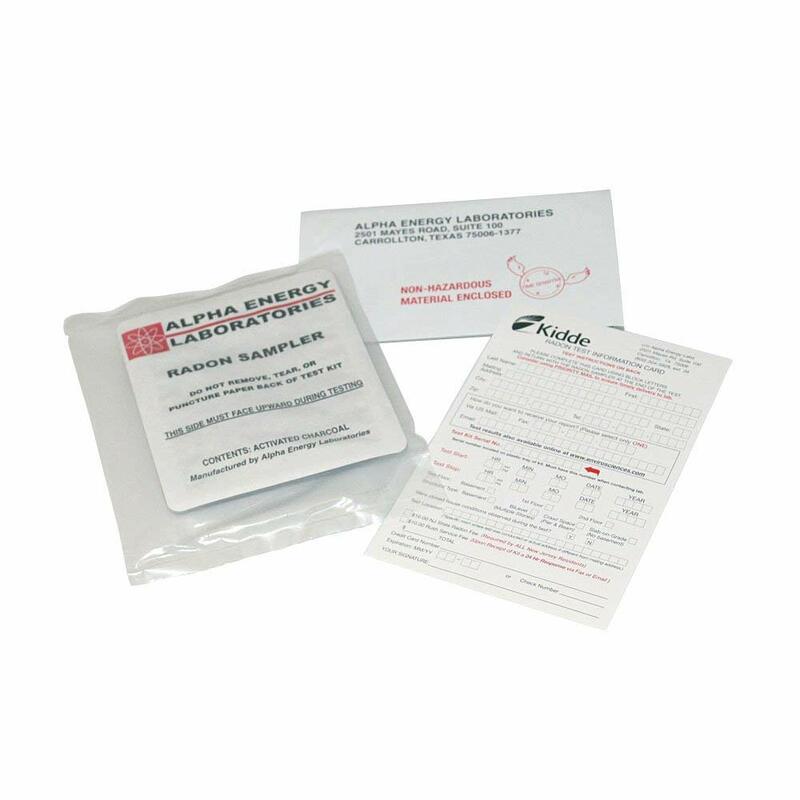 Kidde provides an all-in-one radon sampler bag that simply needs to be placed in the testing location for two to three days. Then, you send it to the laboratory in the provided return envelope. Pros: This kit is great for short-term radon tests. Install your radon detector at the lowest level where people spend time. For example, if you use the basement as a game room or workspace, perform a radon test there. Radon usually disperses when it reaches three stories above ground, so while you can install a detection kit there, you’re unlikely to gather a statistically significant sample for analysis. Once you decide which floor to test, follow the instructions for your radon detection kit and these five best practices to get accurate results. 1. Place the detector in a discreet location away from windows and doors because outside air can affect its reading. 2. Avoid setting up the kit in the kitchen, bathroom, or laundry room. The increased humidity in these locations causes some detectors to malfunction. 3. Also avoid crawl spaces, construction joints, and sump pumps. They can produce a false positive, or incorrectly high, result. 4. Document the test. Write down the start and end date and time for the test. This will help with comparing results and deciding whether to perform another test. 5. Interpret the results. Your home should stay below two picocuries per liter (pCi/L), a measurement that indicates average, year-round radon levels. If your home measures between 2 pCi/L and 4 pCi/L, you may want to take steps to reduce the radon levels. Any result above 4 pCi/L should be confirmed with a follow-up test. If the result remains high, take immediate action to reduce the radon levels in your home. If you don’t want to do it yourself, you can always hire a certified professional to assess radon levels. You’ll pay a bit more, but it can be worth the convenience. With one or two of the products listed above—some people combine short- and long-term kits—you will quickly know your risk of exposure to radon. With this knowledge, you can rest easy or take action as needed. In either case, you’ll end up with a safer, healthier home and family. Radon detectors come in a variety of types, shapes, and sizes. Some are designed as one-time tests, while others offer continuous monitoring. We recommend starting with an inexpensive radon gas test kit, and then—if the results are concerning—purchasing an electronic radon detector to continue to monitor your home. 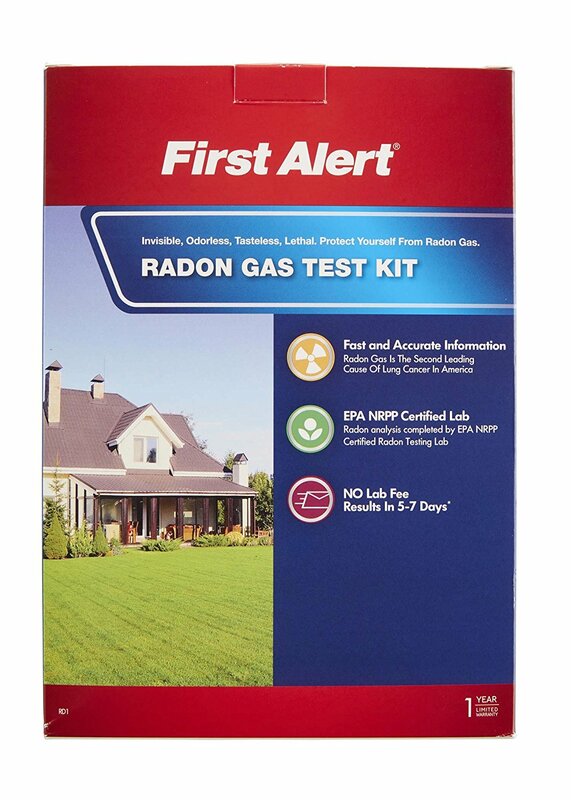 A short-term radon test kit is designed to give you fast answers. If you’re in a time crunch because you’re selling your home, or if you’ve just moved into a new home and you want to check the air quality, these tests are a good way to get a quick snapshot of your home’s radon gas levels. Short-term kits use charcoal to absorb radon radiation, and they typically need between two and ninety days to get a good reading. You can decide how long you’d like your test period to be depending on your circumstances, but the longer you test, the more accurate your results will be. When the test period is up, just send the kit to a laboratory and technicians will use a special process to count the number of radioactive particles emitted from the charcoal. You’ll get your lab results by email in about a week. 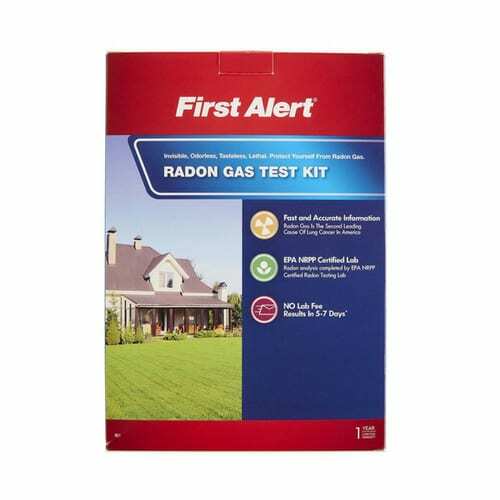 Short-term kits like First Alert Radon Test Kit are around $14, but because radon levels can change depending on the season and the weather conditions, you may not always get reliable results from a short-term kit. Also keep in mind that some short-term kits require an additional lab fee (the lab fee is included with the First Alert kit). If your budget is really tight, it’s worth checking to see if your state offers free or inexpensive radon test kits to residents through their state radon program. The state of Virginia has kits available to residents for just a $3 shipping fee, with lab fees included. If you’re looking for a more reliable overall picture of your home’s radon levels, a long-term test kit is a good choice. Long-term kits use a process called alpha track detection to measure radon gas in the air over a period of three months to a year. When alpha particles hit the coated plastic or foil sheet in the kit, they make pockmarks on the surface. Lab technicians count the pockmarks to determine average radon levels for your home. Long-term kits are more expensive than short-term kits, but they’re also more accurate because they measure radon levels over a longer period of time. 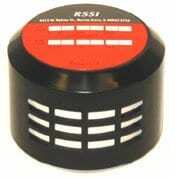 The RSSI Alpha Track Radon Detector Kit has lab fees included and is affordably priced at around $25. 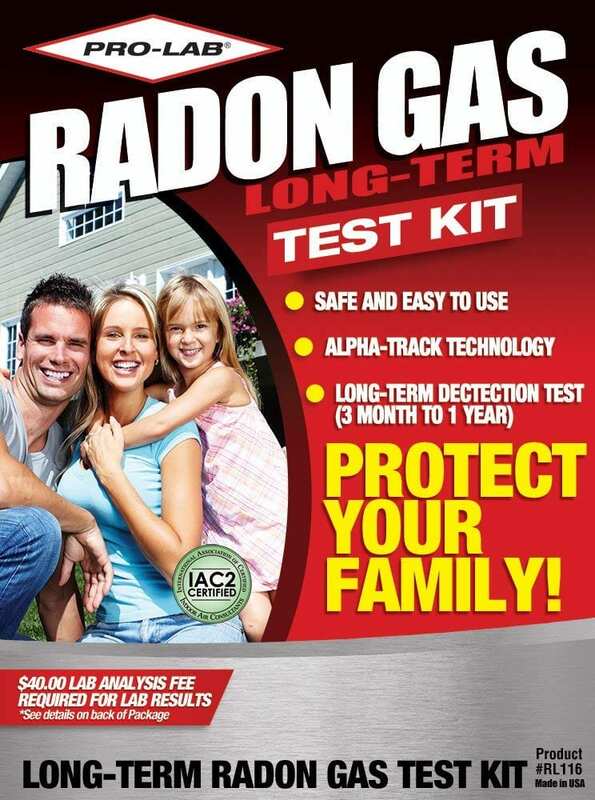 The PRO-LAB Radon Gas Test Kit is another option, but its purchase price doesn’t include the $40 lab fee for testing. If your test kit report indicates that you have high levels of radon in your home, you’ll want to take steps to reduce the amount of radon gas you and your family are exposed to. After getting some help from a qualified radon contractor to better seal your home against leaks and add ventilation, it’s a good idea to continue to monitor your home’s radon levels with an electronic radon gas detector. This will reassure you that your preventative measures are working—or let you know if they’re not. An active radon detector can report radon readings throughout the day, and some can even give you averages over the course of a month or a year. In the past these kinds of devices could only be used by professionals, but there are now several user-friendly options available for the average homeowner. The Corentium Home Radar Detector by Airthings looks like a cellphone and runs a little under $200. 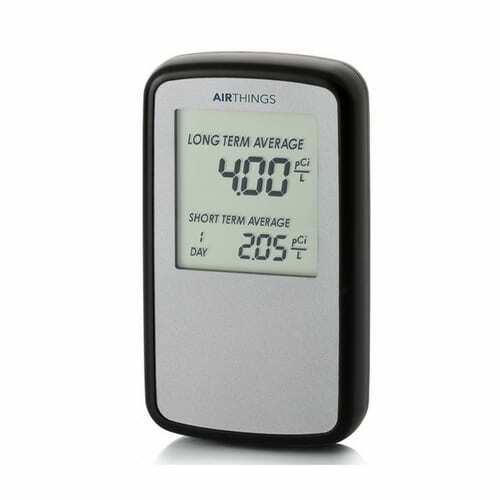 It’s battery-operated and portable, and it claims to be accurate even in dusty and humid conditions. A slightly less attractive but also less expensive option is the Safety Siren Pro Series3, which runs about $150. The Safety Siren plugs into the wall and acts as a threshold detector, sounding an alarm if your radon levels go above 4 pCi/L (picocuries per liter). It has a digital display and updates levels of radon every hour. If you have your home’s thermostat and security system connected to your phone, why not have your radon gas detector connected as well? Smart radon detectors use apps so you can easily check your home for radon contamination and control the device’s settings. The Airthings Wave Smart Radon Detector (around $200) is one of the sleekest we’ve seen—it’s a simple, white, wall-mounted disc with an integrated motion detector. To check radon levels, just wave a hand in front of the detector and the light in the center will glow green if everything is okay, yellow if levels are getting high, and red if levels reach the danger zone. It works with Amazon Alexa and IFTTT (If This Then That), and you can use the app to check your home’s temperature and humidity. The Radon Eye and the Radon Eye Plus also incorporate smart technology, but the Radon Eye only has Bluetooth connectivity while the Plus has Wi-Fi. Both offer reliable data for radon levels within the first hour of use. As a homeowner, a basic consumer radon detector should suit your needs just fine. But if you’re wondering what the pros use, it’s a device called the AlphaGuard by Bertin Instruments. It weighs nearly 14 pounds and it’ll set you back anywhere from $1,500 to $13,000. Companies that manufacture consumer radon-detecting equipment use the AlphaGuard in their labs to calibrate their products, so it’s pretty much the gold standard as far as radon detection goes. A company representative told us that construction companies often purchase this device to use on-site for larger building projects, like apartment complexes. Because radon is an odorless, colorless gas, it can be in your water supply as well as your air, especially if your water comes from a well. Drinking radon in your water won’t harm you, but water vapor that gets into your lungs (like steam from a shower or cooking) can cause damage if it contains radon. While there are no real monitoring devices for detecting radon in water, you can test your water for the presence of radon using a test kit. If you find levels over the recommended limit, you can install a water filter that uses granulated carbon at the point of entry to prevent radon in your home’s water supply. Radon is a byproduct of uranium, which is found naturally in soil. As uranium decays, it releases radioactive particles of radon called radon daughters (or alpha particles), which can then seep in through tiny cracks in your foundation and walls. These particles then get trapped in the air in your home. What buildings are most likely to be affected by radon contamination? Radon isn’t picky about where it shows up. Any building—a home, school, office, store, or warehouse—is susceptible to radon contamination. It’s a common misconception that radon is more likely to be found in homes with basements or in older homes, but the truth is that any home can have a radon issue, new or old, basement or not. Similarly, your neighbor’s home might have a serious radon problem, but yours may not. There’s no way to predict exactly where radon might show up, but you can check the EPA’s color-coded map to see predicted averages for every county in the continental US. What’s a safe concentration of radon? According to the EPA, any radon exposure can be hazardous to your health, so really there is no safe radon concentration. But the EPA does advise that your risk for lung cancer is greatly reduced when radon levels are below 4 pCi/L. How do I get the most accurate results from my radon gas test kit? When you’re testing the radon concentration in your home, keep doors and windows closed during the testing period (except for normal entry and exit). This allows the test to better measure if your home is trapping radon. If you’re having unusual weather, like high winds or storms, wait until things calm down before starting your test. Then place the test in the lowest living space in your home at about three to four feet off the floor. Remember, the longer you leave the test out, the better results you’ll have. What is the best location for my radon detector? Your radon detector is designed to find out how much radon you’re being exposed to on a daily basis, so keep it nearest the lowest level areas where you and your family spend the most time. If you have a basement and it’s a place where you or other members of your household frequently spend time, then put it there. If you have a basement but you’re not down there a lot, then keep it on the main level of your home. How long will my radon detector work? Radon detectors typically last about ten years, with a lifespan similar to that of smoke detectors and carbon monoxide detectors. What should I do if I find high levels of radon in my home? Once you know your levels are higher than the recommended amount, your first step is to find a contractor qualified in radon mitigation. Contact your state radon office for a list of contractors in your area. Once you select a contractor, they will usually begin by sealing any cracks or crevices in your foundation. Then, they’ll install a mitigation ventilation system to help air better circulate and reduce the risk of radon inside your home. Because few cases of radon contamination are the same, each one will have a different price tag. But on average, you can expect to pay at least $500 for basic mitigation services, and possibly more if it you have a trickier situation. They say knowledge is power, and when it comes to a sneaky killer like radon, it’s true. Be sure to test your home for radon at least once every two years, and if you have any concerns, investing in a quality radon detector is a smart way to keep on top of your home’s radon levels. Both the EPA website and your state radon office are great resources for more information and additional expert help in your local area.